At that time Shakyamuni Buddha emitted a light from his flesh cowl, the mark of a great person, and a radiance issued forth from the white hair-mark between his eyebrows, everywhere illumining Buddha worlds to the east equal in number to the grains of sand in one hundred and eight myriads of kotis of nayutas of Ganges Rivers. Beyond these, there was a world by the name of Adorned with Pure Light. In that world was a Buddha by the name of Wisdom of Pure Flower Constellation King Thus Come One, One Worthy of Offerings, One of Right and Universal Knowledge, One Whose Clarity and Conduct Are Complete, Well Gone One Who Understands the World, Supreme Lord, Regulating Hero, Teacher of Gods and Humans, Buddha, World Honored One. He was reverently surrounded by a great multitude of limitless, boundless Bodhisattvas to whom he was speaking the Dharma. The light that issued forth from Shakyamuni Buddha’s white hair-mark universally illumined that country. C2. Disciples who receive the Dharma. E1. Emitting light to summon those from the east. This is Chapter Twenty-four, "The Bodhisattva Wondrous Sound." This Bodhisattva's sound was subtle, wonderful and inconceivable. Why was it wonderful? When he spoke the Dharma, his voice remained forever in the ears of living beings. Living beings whose ears received this amazing sound would never forget the Dharma that Wondrous Sound Bodhisattva had taught them. 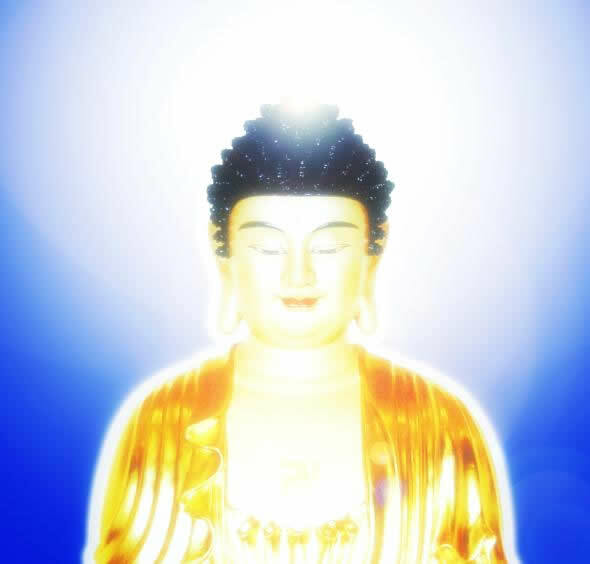 At that time Shakyamuni Buddha emitted a light from his flesh cowl, the mark of a great person. The flesh cowl represents the perfection of the fruit of enlightenment. The mark of a great person refers to the Buddha's thirty-two marks. The flesh cowl is one of those marks. And a radiance issued forth from the white hair-mark between his eyebrows. The white hair-mark light represents the perfect cause of the Middle Way. The cause and fruit are both perfect and nondual. The fruit is just the cause; the cause is just the fruit. This doctrine represents the Middle Way. This light was everywhere illumining Buddha worlds to the east equal in number to the grains of sand in one hundred and eight myriads of kotis of nayutas of Ganges Rivers. Beyond these, there was a world by the name of Adorned with Pure Light. In that world was a Buddha by the name of Wisdom of Pure Flower Constellation King. The "Pure Flower" is the lotus. The "Constellation King" refers to the moon, because the moon is the king of the stars. "Wisdom" means that he had wisdom like the moon, which shines on all things. Thus Come One, One Worthy of Offerings, One of Right and Universal Knowledge, One Whose Clarity and Conduct Are Complete, Well Gone One Who Understands the World, Supreme Lord, Regulating Hero, Teacher of Gods and Humans, Buddha, World Honored One. He was reverently surrounded by a great multitude of limitless, boundless Bodhisattvas to whom he was speaking the Dharma. This Buddha was speaking the Dharma for all the great Bodhisattvas, great Arhats, great Bhikshus, great Bhikshunis, great novices, and so on. The light that issued forth from Shakyamuni Buddha's white hair-mark universally illumined that country. At that time in the country Adorned with All Pure Light, there was a Bodhisattva by the name of Wondrous Sound, who had, for a long time, planted the roots of virtue by making offerings and drawing near to limitless hundreds of thousands of myriads of kotis of Buddhas and had completely accomplished profound wisdom. He had obtained the Samadhi of the Wonderful Banner Mark, the Samadhi of the Dharma Flower, the Samadhi of Pure Virtue, the Samadhi of the Playfulness of Constellation King, the Samadhi of No Affinity, the Samadhi of the Seal of Wisdom, the Samadhi of Understanding the Speech of all Living Beings, the Samadhi of the Accumulation of All Merit and Virtue, the Samadhi of Purity, the Samadhi of Playful Roaming of Spiritual Penetrations, the Samadhi of the Wisdom Torch, the Samadhi of Royal Splendor, the Samadhi of Pure Light, the Samadhi of the Pure Treasury, the Samadhi of Difference, and the Samadhi of Sun-Revolution. He obtained such great samadhis as these, equal in number to the grains of sand in a hundred thousand myriad kotis of Ganges Rivers. E2. Coming westward on command. F1. The reason for coming. G1. Narrator describes his virtue. This passage of text lists sixteen samadhis. These sixteen are chosen to represent the limitless great samadhis. It is not easy to explain sixteen samadhis. It would be even harder to explain more than sixteen! At that time in the country Adorned with All Pure Light, there was a Bodhisattva by the name of Wondrous Sound. We say in the East there is Wondrous Sound and in the West there is Contemplator of the World's Sounds. People who do not understand the Buddhadharma sometimes insist that they are Dharma brothers, but really they are far apart. It is ten myriad kotis of Buddhalands from here to the West. It is one hundred and eight myriad kotis of nayutas of Buddhalands of Ganges Rivers’ sands from here to the East. That is really too far away. I do not believe that they could be brothers, maybe "blood-brothers," but not real brothers. Wondrous Sound was a Bodhisattva who had, for a long time, planted the roots of virtue. A long time does not mean one or two days, one or two months, or one or two years. It means millions of years. When you study the Buddhadharma, you should not think that two and a half days is enough. You should persevere in your study. He spent his time by making offerings and drawing near to limitless hundreds of thousands of myriads of kotis of Buddhas and had completely accomplished profound wisdom. He had realized the profound wisdom. He had obtained the Samadhi of the Wonderful Banner Mark. The Wonderful Banner Mark is the real mark. The basic substance of the real mark is higher than all things. Although it is higher than all things, it is without a mark. Although it is without a mark, there is nothing not marked by it. There is no mark and nothing not marked, and so we call it the Wonderful Banner Mark Samadhi. The Samadhi of the Dharma Flower. The Dharma Flower Samadhi is the nonduality of cause and effect. The cause is just the effect; the effect is just the cause. Cause and effect are simultaneous. Why is the analogy made to the lotus flower? The lotus flower blooms and bears fruit at the same time. As soon as the lotus blooms, the lotus seeds are present as well. This also represents the nonduality of provisional and real. One bestows the provisional for the sake of the real, and opens the provisional to reveal the real. The provisional is just the real; the real is just the provisional. The provisional and real are not two, they are nondual. Cause and effect are not two. The roots and traces are not two. That is, the roots, the events of the distant past, and the traces now manifesting are not two. The present life is the traces; past lives are the roots. They are not two. This is the Dharma Flower Samadhi. The Samadhi of Pure Virtue. What is pure virtue? It is to separate from the filth of the three kinds of delusion: view and thought delusions, delusions of ignorance, and delusions like dust and sand. Delusions just make you confused. When you see a state, you get confused. When you think about a state, you get confused. When you can neither see nor think clearly, you have the delusion of ignorance. View delusion means that "faced with a state, you give rise to greed and love." Something happens and you get greedy and produce craving for it. Thought delusion refers to "producing discrimination based on faulty understanding of principle." You are confused about the principle, and you discriminate about it. The more you discriminate, the farther off you get; the farther off you get, the more you discriminate. You become separated from your original wisdom by a great distance. Are the root of pain. The three delusions are impure, so they are called filth. When one separates from the filth of the three delusions and is certified to the original pure self-nature, that is called the Samadhi of Pure Virtue. The Samadhi of the Playfulness of Constellation King. This samadhi is just like a play, a game. The parts get handed out, and you take your place on the stage for the play, or you sit in the audience. It represents provisional wisdom. You use your provisional expedient wisdom to act out your part in the play. With provisional wisdom you illuminate potentials. You must have provisional wisdom to attract the opportune living beings. If you try to use real wisdom, it would not work. Real wisdom illumines principle, not potential beings. Illumining the potential beings is like the moon, which waxes and wanes. It waxes when it is supposed to wax, and wanes when it is supposed to wane. It takes a clever, ingenious kind of wisdom to do these things. If you are not clever and ingenious but are rather dull and plodding, then it is not going to suit the potentials. Dull and plodding, you might go and get angry at the poor people. You try to lecture Dharma to these people, but instead you get enraged. Lecturing the Dharma should be a happy event. Even if you are debating with someone, you can be cordial about it. You do not have to get mad and be a sore loser. That just shows you lack provisional wisdom. To say nothing of provisional wisdom, you do not have any sense at all! If you listen to someone speak the Dharma and it does not suit you and you get mad, it is a sign that you lack provisional wisdom. Great compassion of being of the same substance with all. The Samadhi of the Seal of Wisdom. The seal of wisdom refers to the three types of wisdom in a single thought. With one thought the three types of wisdom exist: All-Wisdom, the Wisdom of Modes of the Way, and the Wisdom of All Modes. These three types of wisdom are used to "seal" and "certify" all dharmas. The Samadhi of Understanding the Speech of All Living Beings. In this samadhi you unite with all living beings. You understand the languages not only of people, but of all creatures: horses, cows, sheep, chickens, dogs, pigs—all of them. Not only do you understand the languages of one country, but you understand the languages of all people and creatures in all worlds. You understand the languages of all living beings within the nine Dharma realms. One language is all language; all languages are one language. With the understanding of one, all are understood. But first you have to understand the one. If you do not understand the one, you cannot understand them all. Confucius' disciple Yan Yuan could hear one principle and understand ten. Zi Gong could hear one principle and understand two. All languages are dharmas born of causes and conditions. Within the dharmas born of causes and conditions, one understands that they do not go beyond emptiness, falseness, and the middle. Understanding the contemplation of emptiness, falseness, and the middle, you then gain the Samadhi of Understanding the Speech of All Living Beings. The Samadhi of the Accumulation of All Merit and Virtue. While dwelling in one samadhi, one perfects the merit and virtue of all samadhis. One samadhi penetrates all samadhis. The merit and virtue of all samadhis return to the one samadhi. The Samadhi of Purity. Purity refers to the purification of the six sense faculties: eyes, ears, nose, tongue, body, and mind. When the six sense faculties are purified, one attains to the comfort of mutual interpenetration of the six faculties. The Samadhi of Playful Roaming of Spiritual Penetrations. Spiritual penetrations are the wonderful function of comfort. One uses comfortable spiritual penetrations to teach and transform living beings as one roams and plays throughout the three thousand great thousand world system. It is like an illusion, like putting on a play. Yesterday I brought up the analogy of the world being like a play, and all of you understood it right away. Actually, the play I was talking about was not like the one you understood it to be. I am talking about the play of the playful roaming samadhi, a kind of spiritual penetration. To act in this play, you must have spiritual powers. This is the samadhi of illusion. One takes an illusory journey among people, gathering in and saving all living beings. You employ the spiritual powers of all things being like an illusion. The Samadhi of the Wisdom Torch. Wisdom is like a torch, a kind of light. Using the wisdom of great equality, one universally illumines all darkness, dispersing it entirely. The Samadhi of Royal Splendor. This means to adorn the royal nature. The self-nature is like a king. To adorn it, you must cultivate. Basically, the self-nature is complete with the myriad virtues, and it is entirely unobstructed and interpenetrating. You very casually take up one dharma with which you can connect with all dharmas. Whichever dharma you select has the Dharma nature. The Samadhi of Pure Light. This refers to the three types of wisdom: All Wisdom, Wisdom of Modes of the Way, and the Wisdom of All Modes. These three types of wisdom are perfect and pure, illumining all dharmas without exception. The Samadhi of the Pure Treasury. In a single thought, the mind obtains purity and can universally gather in the myriad virtues. The Samadhi of Difference. "Different" means different from the Three Vehicles: the Hearers, Those Enlightened to Conditions, and Bodhisattvas. The Samadhi of Difference is the Buddha's samadhi. And the Samadhi of Sun-Revolution. One uses real wisdom to illumine the principle, shining on the universe. Like the sun moving through the sky, one does not dwell anywhere. He obtained such great samadhis as these, equal in number to the grains of sand in a hundred thousand myriad kotis of Ganges Rivers. The Bodhisattva Wondrous Sound, in the past, made offerings of music to all the Buddhas, and so he obtained the aforementioned sixteen great samadhis. Actually, he did not obtain just sixteen samadhis, but as many samadhis as there are grains of sand in a hundred thousand myriad kotis of Ganges Rivers. G2. Having been illumined, he takes leave of the Buddha. From the white hair-mark between his eyebrows, Shakyamuni Buddha had emitted light that illuminated the eastern direction, shining into lands as many as the grains of sand in one hundred and eight myriad kotis of nayutas of Ganges Rivers. It shone on the Bodhisattva Wondrous Sound in the world Pure Adornment. When Shakyamuni Buddha's light illumined his body, he immediately spoke to the Buddha Wisdom of Pure Flower Constellation King, saying, "World Honored One, having received the light of Shakyamuni Buddha, I feel I should go to the Saha world to bow to, draw near to, and make offerings to Shakyamuni Buddha, and to see the Dharma Prince Bodhisattva Manjushri, the Bodhisattva Medicine King, the Bodhisattva Courageous Giving, the Bodhisattva Constellation King Flower, the Bodhisattva Mind of Superior Practice, the Bodhisattva King of Adornment, and the Bodhisattva Medicine Superior." G3. Instructions from that Buddha. At that time the Buddha Wisdom of Pure Flower Constellation King told the Bodhisattva Wondrous Sound, "You should not look lightly upon that country or think of it as inferior. You should not do a lot of negative thinking about its bad qualities. Good man, the Saha world is uneven. Its earth, stones, and mountains are filled with filth and evil. That Buddha's body is lowly and small, about six feet tall, quite short and tiny. The Bodhisattvas are also small in shape—there are many mini-Bodhisattvas. “Your body is forty-two thousand yojanas in height. The living beings there will stand at your feet, look up at you, and would not even be able to see your head! My body is six hundred and eighty myriad yojanas in height. Your body is superb and upright, with a hundred thousand myriad blessings and fine and subtle light. When you get to the Saha world you will tower over Shakyamuni Buddha with all your glorious appearance. Therefore, if you go, do not look lightly upon that country, its Buddha, Bodhisattvas, or lands.” This was the advice that the Buddha gave the Bodhisattva Wondrous Sound. Actually, Wondrous Sound Bodhisattva would not look down on the beings of the Saha world, so why did the Buddha Wisdom of Pure Flower Constellation King give him this advice? Some of the Bodhisattvas who went along with him belonged to the provisional vehicle and lacked a certain amount of wisdom. Since their wisdom was not as profound, he was afraid they might look down on the Saha world, and having done so, fall. G4. The Bodhisattva takes advice. The Bodhisattva Wondrous Sound said to the Buddha, "World Honored One, I shall now go to the Saha world, and this is all through the power of the Thus Come One. It is not on my own power, but rather by means of the playful roaming spiritual penetrations of the Thus Come One and the adornments of merit, virtue, and wisdom of the Thus Come One." The Bodhisattva Wondrous Sound could have gone on his own. Why did he give credit to the Buddha? It was because he yielded all merits to the Buddha. He would not say, "See how talented I am? I can go to the Saha world. My spiritual powers and miraculous functions are inconceivable." Instead, he said, "The Buddha is helping me. That is how I can do it." Western people would say he was being too polite, or that perhaps he really did not have such spiritual powers, but that is not the case. He did have the powers, but he wished to show his respect for the Buddha in this way, and so he credited everything to the Buddha's compassionate assistance. It was through the Buddha's compassion and patience, and the merit of the emptiness of Dharmas. Then the Bodhisattva Wondrous Sound, without rising from his seat, his body motionless, entered samadhi. With the power of samadhi he went to Mount Gridhrakuta, not far from the Dharma seat. He then created by transformation eighty-four thousand jeweled lotuses, their stems of Jambunada gold, their leaves of silver, their pistils of vajra, and their sepals of kumshuka jewels. G5. Manifesting signs in advance of his arrival. H1. Sending the lotuses on ahead. Then the Bodhisattva Wondrous Sound, without rising from his seat, his body motionless in full lotus posture, his mind without false thinking, entered samadhi. With the power of samadhi he went to Mount Gridhrakuta, to the Dharma assembly at Vulture Peak, not far from the Dharma seat of Shakyamuni Buddha. He then created by transformation eighty-four thousand jeweled lotuses, their stems of Jambunada gold, their leaves of silver, their pistils of vajra, and their sepals of kumshuka jewels.Kumshuka is a Sanskrit word that means "red jeweled flower." The Dharma Prince Manjushri, seeing the lotuses, asked the Buddha, “World Honored One, what is the reason for this portent, these several thousands of myriads of lotuses, their stems of Jambunada gold, their leaves of silver, their pistils of vajra and their sepals of kumshuka?” Although he had such great spiritual powers, Manjushri still did not understand this state. Even though the Bodhisattvas were all Equal Enlightenment Bodhisattvas and had been certified to the same fruition, still each one had his special abilities. If one manifested some spiritual powers, the other might not understand them, and vice-versa. Wondrous Sound Bodhisattva manifested this portent. Manjushri, even though he really did understand, asked the question on behalf of the others who did not. At that time Shakyamuni Buddha told Manjushri, “The Bodhisattva Mahasattva Wondrous Sound, surrounded by eighty-four thousand Bodhisattvas, wishes to come from the country of the Buddha Wisdom of Pure Light Constellation King to this Saha world to make offerings, draw near to, and bow to me. He also wishes to make offerings and listen to the Dharma Flower Sutra.” Those are the reasons for his coming to this world. H4. Manjushri asks to see him. Manjushri said to the Buddha, "World Honored One, what good roots has this Bodhisattva planted? What good roots did he plant in the past? What merit and virtue has he cultivated that he can have this great power of spiritual penetrations? And what samadhi has he practiced to gain such fine spiritual powers? I pray that you will tell us the name of this samadhi. We, too, wish to cultivate it diligently. All of us here in the Dharma assembly, the Hearers and the Bodhisattvas, also want to cultivate this samadhi and to obtain such inconceivably great spiritual penetrations. For by practicing this samadhi, we will be able to see this Bodhisattva. Once we accomplish this samadhi, we will become this Bodhisattva's fellow cultivators; we will have cultivated the same Dharma-door. And then we will be able to see this Bodhisattva, his appearance, size, and awesome manner, and his comings and goings, in the four comportments of walking, standing, sitting, and lying down. We only pray that the World Honored One will, by means of the power of spiritual penetrations, let us see that Bodhisattva when he comes. I, Manjushri, and all the other Bodhisattvas, Bhikshus, Bhikshunis, Upasakas, Upasikas, and so forth all want to see him." H5. Shakyamuni Buddha gives the job to Many Jewels. Manjushri Bodhisattva wanted to see the Bodhisattva Wondrous Sound and asked the Buddha to invite him to the assembly. At that time Shakyamuni Buddha told Manjushri, "The long extinct Thus Come One Many Jewels, who passed into stillness long ago, who went to Nirvana long ago, shall, for your sakes, manifest these signs." H6. Many Jewels orders him to the assembly. The Buddha Many Jewels then spoke up and said to the Bodhisattva Wondrous Sound, "Good man, come here! The Dharma Prince Manjushri wishes to see you in person. He wants to make friends with you." The Bodhisattva Wondrous Sound then disappeared from his own country, and together with eighty-four thousand Bodhisattvas, set out on his way. The countries they passed through quaked in six ways, and all rained down lotuses made of the seven treasures, while a hundred thousand kinds of heavenly music played spontaneously. G1. On the road with his retinue. The Bodhisattva Wondrous Sound then disappeared from his own country. Right after the Buddha Many Jewels gave his order, the Bodhisattva suddenly disappeared from his own country, Adorned with Pure Light, and together with eighty-four thousand Bodhisattvas, set out on his way. They all took off for the Saha world for a vacation. They were a rather large group. They did not charter a plane, however, they came via spiritual powers. The countries they passed through quaked in six ways, and all rained down lotuses made of the seven treasures. Wherever they went, flowers rained down out of the sky, while a hundred thousand kinds of heavenly music played spontaneously. As they flew through space, they were accompanied by heavenly music. Nobody had to play it, either; it played all by itself. The Bodhisattva’s eyes were like the broad, large petals of a blue lotus. A hundred thousand myriad moons combines would not surpass the awesome beauty of his facial features. His body was the color of gold, adorned with limitless hundreds of thousands of meritorious virtues. The light of his awesome virtue blazed with brilliant splendor, and his marks were all perfect. His body was as solid as that of Narayana. He entered a terrace made of the seven treasures and rose up into space to the height of seven tala trees. With Bodhisattvas reverently circumambulating him, he came to Mount Gridhrakuta in the Saha world. G2. His appearance as he ascended the terrace. The Bodhisattva's eyes were like the broad, large petals of a blue lotus. A hundred thousand myriad moons combined would not surpass the awesome beauty of his facial features. His body was the color of gold, adorned with limitless hundreds of thousands of meritorious virtues. The light of his awesome virtue blazed with brilliant splendor. Anyone who saw him automatically became very reverent. They were afraid, and yet they wanted to draw near him, because he had awesome virtue and he was also good and compassionate. And his marks were all perfect. His body was as solid as that of Narayana—perfect and indestructible in all respects. The Buddha has eighty subsidiary characteristics. Well, the Bodhisattva had at least seventy-nine. Narayana refers to the Vajra Power Knight whose body is as solid as vajra. He is not afraid of anything—atom bombs, hydrogen bombs, nothing. There is no way to harm him. He entered a terrace made of the seven treasures and rose up into space to the height of seven tala trees, about fifty feet. With Bodhisattvas reverently circumambulating him, he came to Mount Gridhrakuta in this Saha world, to Magic Vulture Mountain in the Saha world.